As subconsultant to Dewberry Engineering, Inc., AEA is currently providing design services for Route 295/76/42 Direct Connection project. 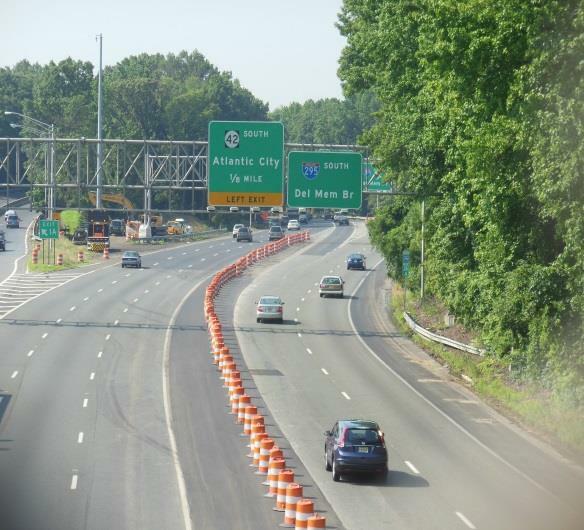 The project encompasses the I-295 /I-76/NJ-Rt.42 Interchange in Camden and Gloucester Counties in southern NJ. Construction of this project will improve traffic safety, reduce traffic congestion, and provide direct connection of the I-295 mainline. This will require the reconstruction and reconfiguration of the I-295/I-76/Route 42 Interchange. AEA is responsible for providing design services for signing and striping for the whole interchange, sign panel layouts, sign support design, 50+ cantilever and overhead sign structures, ITS design, highway lighting, and sign lighting design. Project requires extensive field investigations and extensive coordination with other disciplines and NJDOT. Signing and striping design includes preparation of sign locations, signing and striping plans, and sign panel layout plans. AEA prepared the existing sign inventory, determined the locations of sign structures and ground mounted signs, prepared preliminary sign layout plans and submitted to NJDOT for approval. Signing and striping design is based on the latest MUTCD manual and NJDOT Standards. The sign structures design included preparing general plan and elevations for sign structures, foundation design, and detail preparation. Project is being divided into four construction contracts and one Advance ITS contract. The Advance ITS Contract construction is complete. Contract No. 1 and Contract No. 2 are currently under construction. AEA is providing the shop drawing reviews and responses to contractor RFI’s.